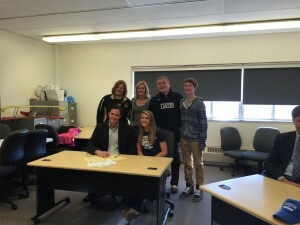 Wednesday November 12th opened the official National Letter of Intent signing period. Wisconsin Laker players signed their letters of intent to attend their respective Universities. Sarah Schumacher and Chenedy Wiles will be holding signing parties next week so we will add their photos soon. Congratulations to all our 7 Players and their Families who have so far signed their letter of intents to play NCAA D1/D2 basketball. All of us at the Wisconsin Lakers are so proud of not only the players you are but also the great young ladies that we all know you are. Up first on Wednesday was Emma Meriggioli the 5’7 Point Guard signed her letter of intent to play for NCAA D2 California Baptist University. Emma will be the 4th Laker at CBU on a Full Ride joiningg; Cassidy Mihalko Sophomore, Emily Schmidt Freshman, and Olivia Weber Sophomore. This past season was Emma’s 2 year with the Wisconsin Lakers and she played for Lakers White. 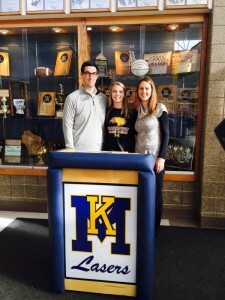 Next was Lindsey Weber the 5’11 Small Forward signed her letter of intent to play for NCAA D2 University of Minnesota Crookston. Lindsey has been a member of the Wisconsin Lakers for 3 years, and played this summer for Lakers Black. Basketball runs in the Weber Family Lindsey’s older sister is on a Full Ride scholarship to CBU, and her dad JJ played for the Wisconsin Badgers. 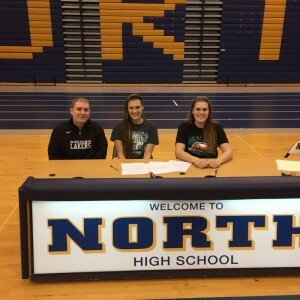 Headed to Sheboygan next to see Mackenzie and Madison Wolf the 6’3 Post both signed with University of Wisconsin Green Bay. Mack and Madison played 3 years with the Wisconsin Laker program and played this summer for Wisconsin Lakers White. Athletics runs in the Wolf Family; dad Jeff played at North Carolina for Dean Smith for Basketball, so did Uncle Joe Wolf who also spent 10 years in the NBA, their brother play basketball at UW Milwaukee, and have a sister at Green Bay who is a swimmer. 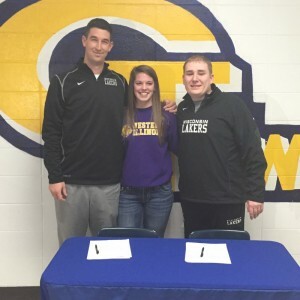 The last signing of the day was Taylor Higginbotham the 5’10 SG signed with Western Illinois. Taylor will be the 4th Laker on a Full Ride Scholarship at Western joining; Michelle Farrow Red Shirt Freshman, Faith Lois Red Shirt Junior, and Ashley Luke Red Shirt Junior. Taylor was a member of the Wisconsin Lakers for 2 years and played for Lakers White. 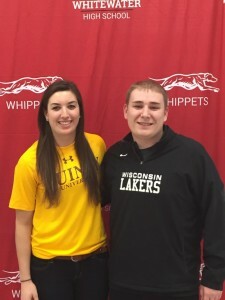 Wednesday was the last day for the early signing period, and Sarah Schumacher 6’1 Forward from Whitewater signed with Quincy University on a Full Ride. This was Sarah’s first year with the Lakers and played for Lakers Black. Sarah has tremendous with ethic.